The terrifying novella from Stephen King which received a big screen adaptation in 2007 is heading to our living rooms. Easily the greatest adaptation of a Stephen King work in the past 20 years, 2007's The Mist is a modern masterpiece of science fiction and suspense that contains one of the most shocking endings in cinematic history (even if it differed from King's original, more ambiguous ending). The third collaboration between King and director Frank Darabont -- after The Shawshank Redemption and The Green Mile -- The Mist tells the story of a small Maine town (go figure) that finds itself engulfed in an ominous fog filled with vicious, deadly creatures from another world. As the bodies of those trapped inside a grocery store begin to pile up, King's story becomes a classic dissection of who the real monsters are once fear takes hold. And now, it appears that The Weinstein Company's Dimension Television will be bringing the horror story to the small screen, with Christian Torpe (creator of Danish series Rita) attached as a writer. "The terror and drama in Stephen King's novella are so vast that we felt serialized television is the best place to explore them in greater depth," said Bob Weinstein in an interview with Deadline, co-chairman The Weinstein Company and Dimension Films. "With this show, Christian has created a fascinating band of characters and a story with infinite scares." As both a huge fan of King's novella and the 2007 big screen adaptation -- the latter of which I have to thank for introducing me to the music of Dead Can Dance -- I am equal parts optimistic and trepidatious about this project, to put it mildly. The main reason Darabont's The Mist worked so well, aside from the brilliant performances of its leads, Thomas Jane and Marcia Gay Harden, was due to how contained it felt. The majority of the film took place in one setting, in one small corner of the world, and focused on how one group of people reacted to a supernatural catastrophe. 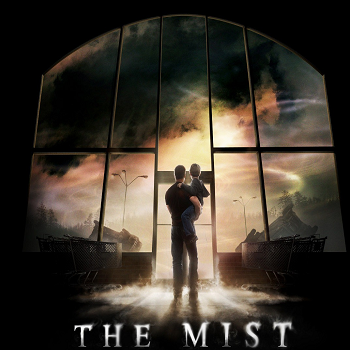 The idea of expanding that universe and interweaving storylines ala The Walking Dead opens The Mist up to a variety of possibilities that were not achievable in the original novel, but could also work against the relentless sense of isolation and claustrophobia which made both the novel and the movie so effective. Then again, a television series based on The Mist has far better source material to rely on than Under the Dome could have ever hoped for, so there's that at least. I guess I'd have to agree with Bustle's Sabienna Bowman that the success of The Mist will depend heavily on not only on the cinematography (how the titular mist itself is portrayed), but in whether or not the story will be able to strike a balance between the characters survival and "their meditation about the nature of the incident like The Leftovers." What do you guys think? Are we in for another King clunker, or will this TV series do the master of terror justice?